D-Capt. Stephen Olney House-Smithfield Rd. E-1879 Fruit Hill Sch.VFW Post-Fruit Hill Ave.
H-Old town Hall(1879)-Mineral Spring Ave.
NORTH PROVIDENCE LOTS IN HISTORIC ZONES—SOURCE: NORTH PROVIDENCE HISTORIC DISTRICT COMMISSION, prepared December 2018, based on and with reference to maps prepared by GIS Coordinator, Dept. of Communications, Town of North Providence, Revised Feb. 2017 with map disclaimer, showing Historical District, Highlighted Plat Map (Plat #’s 8,9,11,12,13,14,15,16,17,18 &20) and surrounding lots. Additional source includes the Site Plan for Plat 17 Lot 4 Subdivision Parcels 1,2,3,5, & 6 Fruit Hill Ave. North Providence 02911, Owner: Imperial Investments, Inc., prepared by MJF Engineering Assoc. June 3, 2017. DISCLAIMER: The North Providence Lots in Historic Zones is not a product of a Professional Land Survey. 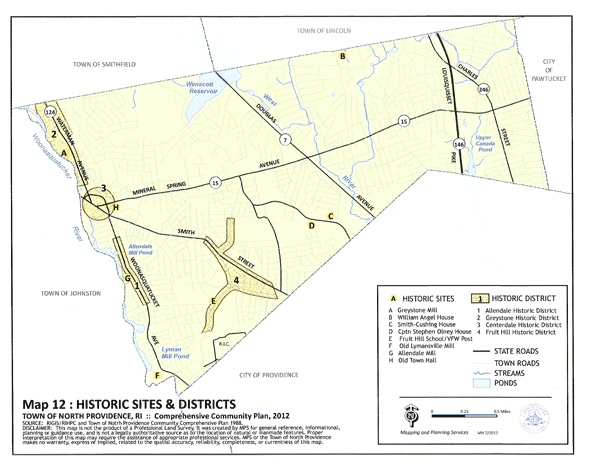 It was prepared by the North Providence Historic District Commission for general reference, informational, planning or guidance use and is not a legally authoritative source as to location of natural or man-made features and is not a legally authoritative source as to the accuracy of street addresses assigned to plat and lot numbers within the historic zones. The Town of North Providence makes no warranty, express or implied, related to the spacial accuracy, reliability, completeness or currentness of the map upon which the North Providence Lots in Historic Zones is based and in which it makes reference. The Town of North Providence makes no warranty, express or implied, related to the accuracy, reliability, completeness or currentness of the North Providence Lots in Historic Zones.